In the mid-13th century, the people of Haldensleber strengthened their defences and added fortified towers to the town gates. 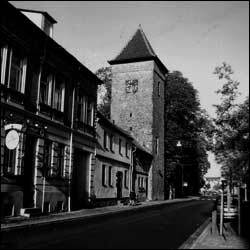 Unlike the other three towers, Bülstringen Gate did not receive a tower with a road passing through it. Instead, a tower reminiscent of a keep was built alongside the road. The medieval pewter crest used in the original building can still be seen from outside beneath the additional uppermost story and belfry added in 1858. The high entrance was originally only accessible via the walk along the battlements, the windowless ground floor being used as a dungeon. It was only in c. 1600 that an entrance was built at ground level the still preserved prison door. The eyelet windows and the rebuilt lavatory oriel were part of the modest comfort enjoyed by the mediaeval defenders of the town. Following the final siege in 1630, the fortifications lost their original function and the gate tower was later converted into a clock tower. Made by Weule and still in working order, the clock is the last thing to be admired by visitors climbing the tower.